RVR volunteer Jennifer Newman shares affection with Coco, one of 15 Paso Fino horses brought to the Riverview rescue ranch. The horses were confiscated from a ranch in Lake Butler. RVR Horse Rescue has taken in 15 of some 51 horses confiscated recently in Lake Butler due to abuse and neglect. The plan is to rehabilitate them at the Riverview ranch, then put them up for adoption. The rescue was in conjunction with the American Society for the Prevention of Cruelty to Animals (ASPCA) and the Union County Sheriff’s Office. RVR spokeswoman Kelly Ford said the Union County Sheriff’s Office did not share details of the investigation with RVR. 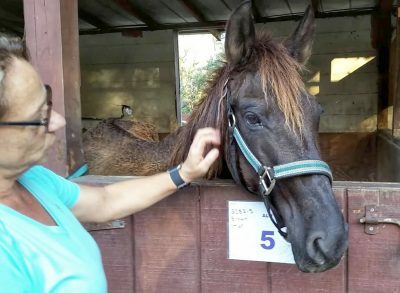 It did say this: Investigators in Lake Butler found 51 horses living in inadequate conditions and exhibiting signs of neglect. Remains of deceased horses were also found on the property and others suffering from various medical issues that required immediate treatment. The ASPCA assisted with evidence collection and the removal of the horses — all Paso Finos. RVR was one of the qualified equine rescues the ASPCA chose to accept these horses and provide ongoing care, rehabilitation and appropriate placement when they’re ready to be rehomed. The horses arrived in Riverview Nov. 5. They were each examined by a veterinarian, and each horse has received an individualized treatment and diet plan. Once the horses have gained weight and recovered, RVR will find them new homes. “The ASPCA divided them up between several rescues in Florida,” Ford said. “RVR had enough space and resources to take 15.” Each has been examined by both a veterinarian and a farrier, she said. None of the horses are wearing shoes, Ford said, but their hooves needed to be trimmed. Volunteers are now working on getting the horses bathed and working the tangles out of their manes and tails. Volunteers are also working to keep the stalls clean and comfortable for the horses. The horses were immediately started on a refeeding program. “When horses have not had access to enough food, their organ systems can be compromised, and their digestive system, in particular, can be shut down,” Ford said. “In situations like this, the horse must be reintroduced to food,” she said. This is done by giving small amounts of an easily digested food every few hours. Typically, this is soaked alfalfa pellets or alfalfa hay. Grain is introduced later, and again, in very small quantities at the start. When the 15 horses first arrived, they were being fed a small amount of alfalfa every two hours. They moved from that to grain and have moved through the initial refeeding. The feed is formulated for older (senior) horses and is easily digested. The amount of alfalfa has increased and the horses are being fed three times per day along with a portion of the senior feed at each meal. To follow the horses’ rehabilitation and progress at RVR, visit www.Facebook.com/rvrhorserescue. RVR is an all-volunteer organization founded in 2004 by Jayroe. It received 501(c)3 status in 2011. RVR specializes in taking in the worst cases of abuse and neglect. Hundreds of horses have come through RVR’s gates suffering from starvation and physical wounds of abuse. They are rehabilitated and re-homed with loving families.